This page shows a typical process of scanning a model and milling it to a final piece. 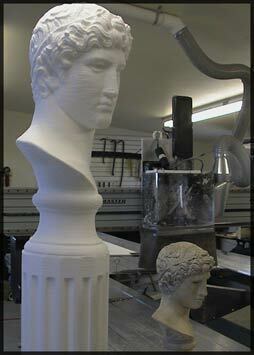 This particular process features our 4 axis CNC router. The router mills the foam, using the data points to make the cuts. By using the data points made during the laser scan, the enlargement is milled, one pass at a time. The finished product & maquette side by side.